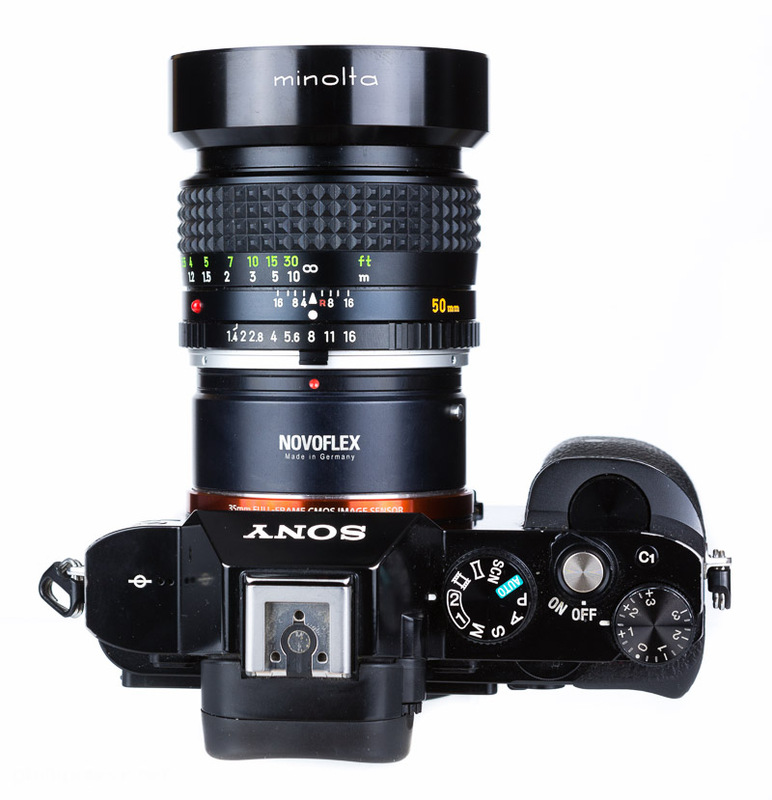 The Minolta MC 50mm 1:1.4 usually sells for around $40-80 at ebay.com (affiliate link). In Germany you can buy it for 50-85€ at ebay.de (affiliate link). The Minolta MC 1.4/50 was released in 1973 and remained in production until 1977. It’s successor was the MD 50mm 1:1.4 which is 65g lighter and a bit shorter. 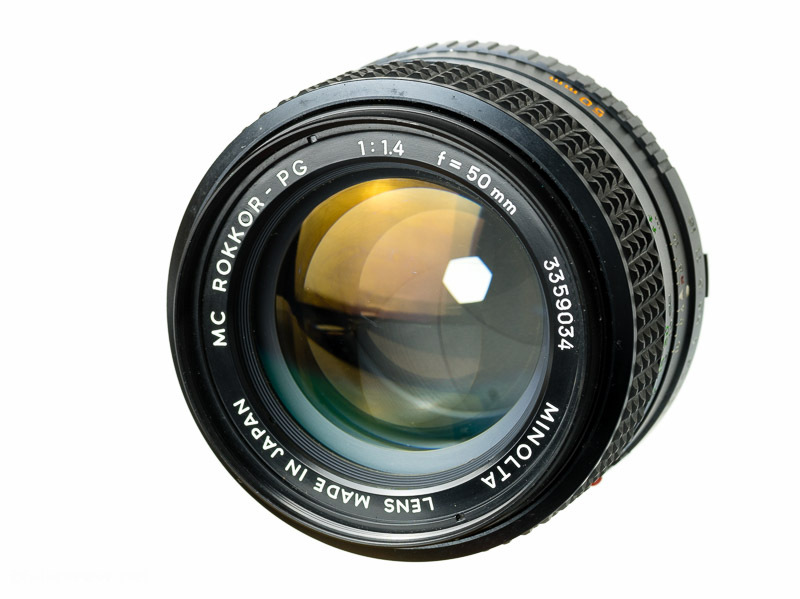 Typically for a Minolta MC lens built quality is great, it doesn’t get much better than this. The lens is made of nothing but metal and glass (well and some rubber for the focusing ring but it has aged well). All markings are engraved. The Minolta MC 1.4/50 is about as large and a little heavier than your average 1.4/50. It is well balanced on the Sony a7 but it feels like a substantial lens. The focusing ring is a pleasure to use because it has just the right resistance and travels about 90 degrees from 0.5m to 1m and a further 80 degrees to infinity. The metal made aperture ring of the has a good resistance and distinctive stops. There is no stop between f/1.4 and f/2, then it stops down half steps to f/16. The original lens hood is made from metal, on the inside it is flocked with a velvety material. Since it is very solid and because it isn’t too large I usually leave it on the lens and put lens the lens in my camera bag without a front cap which speeds up operation. The 55mm filter thread is made from metal. The front of the lens does not rotate. 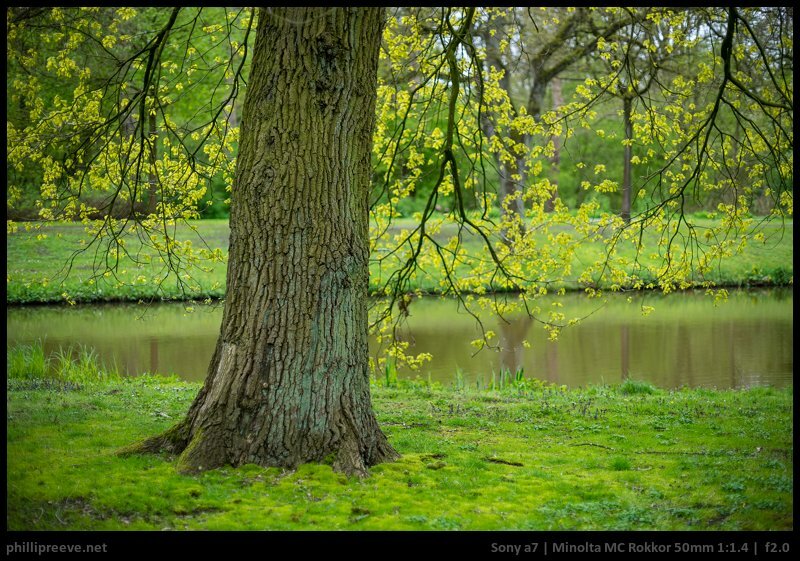 At f/1.4 vignetting is significant, at f/2 it is reduced but still noticeable and from f/2.8 a no-issue. 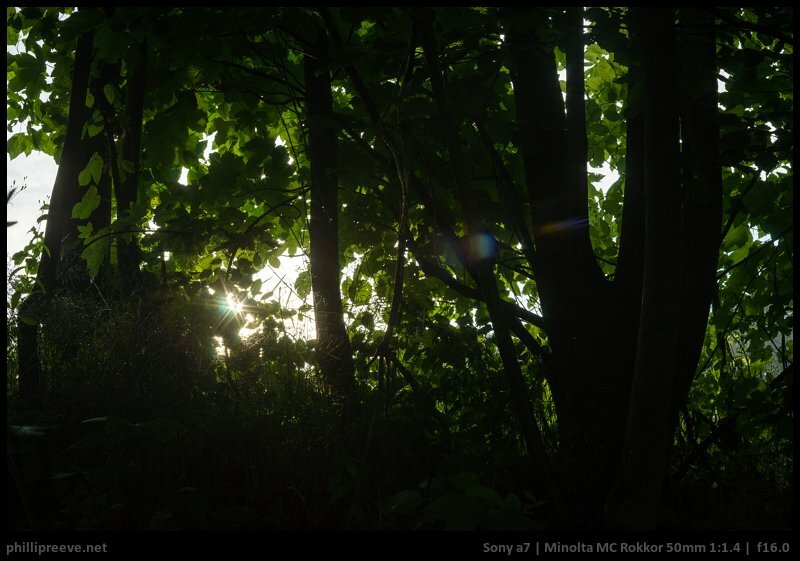 Typical for a Minolta the MC 1.4/50’s flare resistance is nothing to write home about. Both images were taken with the lens hood attached but for the second image I shielded the front lens with my hand as well. It is not like the flare resistance won’t allow you to take any image with the sun in the frame, but you should be aware of it. The lens shows a small amount of barrel distortion. There is a little bit of lateral CA. I would say the performance is average for a 50mm. There is quite a lot of longitudinal CA. Again an average performance for a 50mm. But also much more expensive 50mm lenses struggle in this aspect. 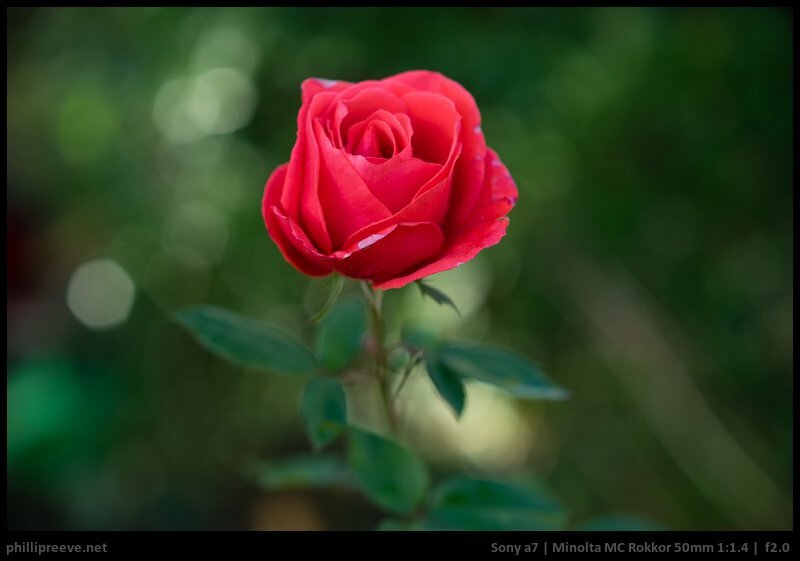 The Minolta MC 1.4/50 doesn’t have the smoothest bokeh but it isn’t bad either. At f/2 the outlining effect is much less annoying but still visible, especially outside of the center. My preferred aperture is f/2.4. Here oof highlights are rendered quite smooth and the shape of the aperture isn’t too obvious. At f/2.8 the hexagonal shape of the aperture is pretty obvious and a bit annoying. Of course bokeh depends a lot on the background, in scenes of low contrast and with backgrounds farther away you can get smooth bokeh even at f/1.4 and especially at f/2.0. 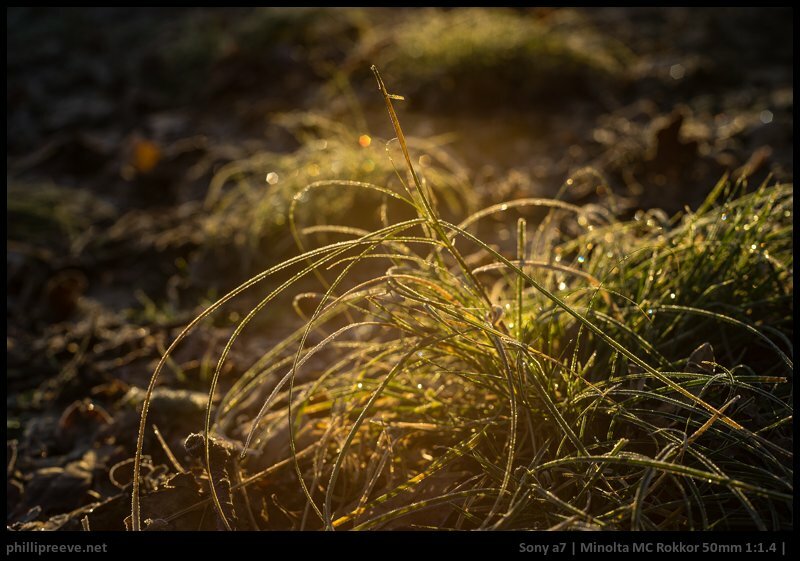 The Minolta MC 1.4/50 only has 6 aperture blades so sunstars only produce 6-pointed stars. 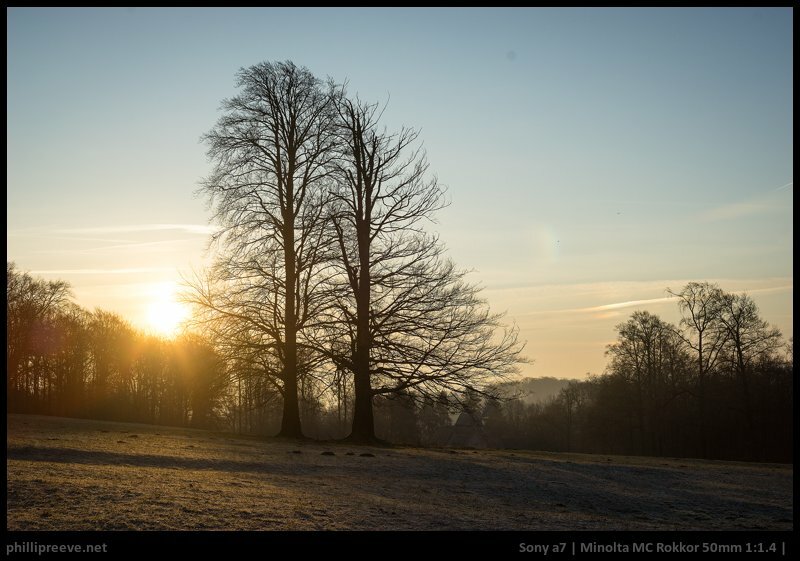 From f/11 they are reasonably well defined but they don’t come close to the nice sunstars of lenses like the Zeiss Loxia 2/50. 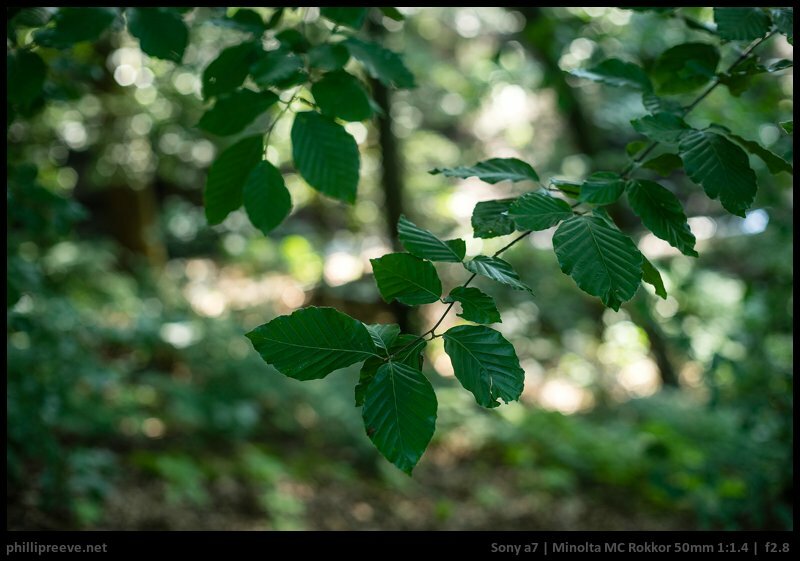 You can find the full resolution test images in the Minolta MC 1.4/50 flickr set. 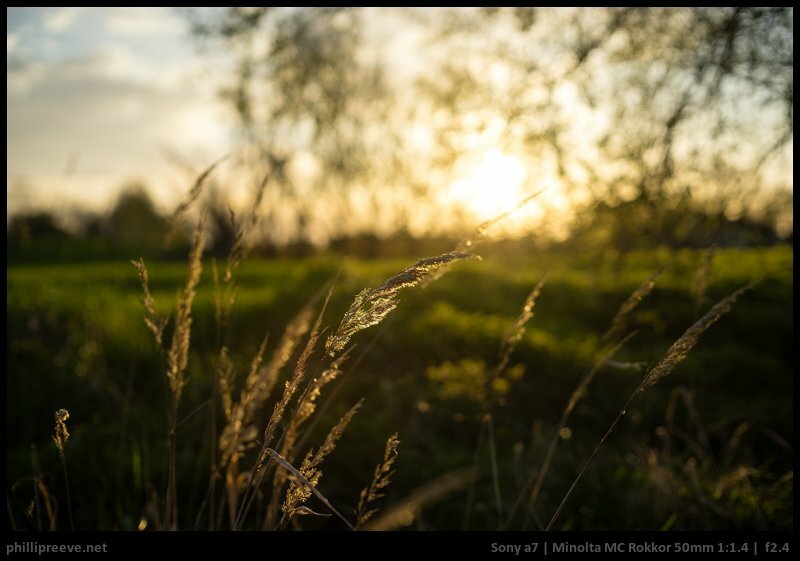 f/1.4: Good resolution in the center, still decent midframe area and bad in the corners. Contrast is quite low. f/2: Performance is much improved and f/2 is my go-to aperture for portraits. The center shows good sharpness but there sharp area is quite small. f/2.8: Any softness is gone, contrast and resolution are excellent in the center and midframe region, the corners only improve a little. 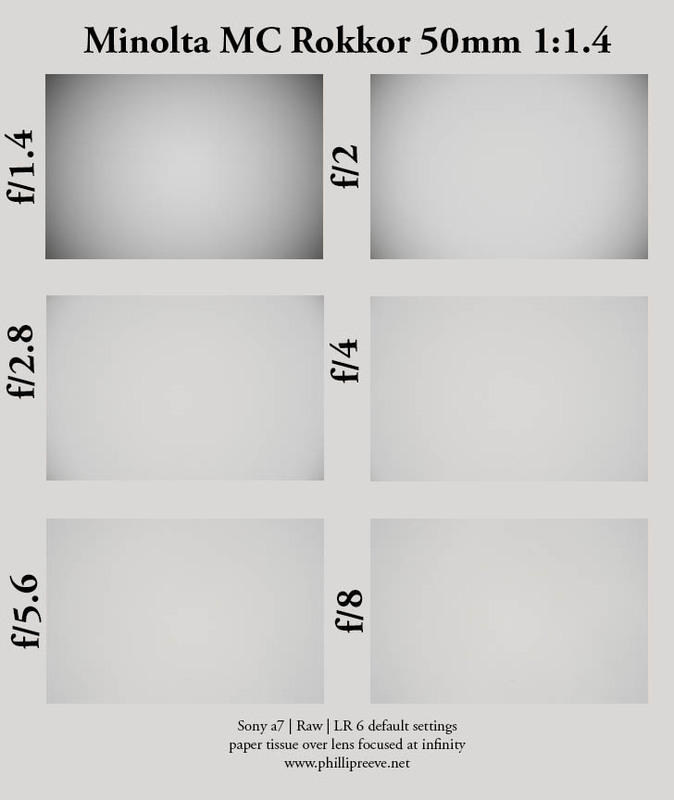 f/4: A significant improvement in the midframe region and further, corners are better but still rather soft. f/5.6: Excellent across the frame, only the extreme corners are a tad softer. f/8: Excellent across the frame. f/11: A little softer due to diffraction. f/2.4 for portraits and images where it is really sharp in the relevant area and you can still blur the background nicely. f/8 for landscapes where everything is tack sharp. 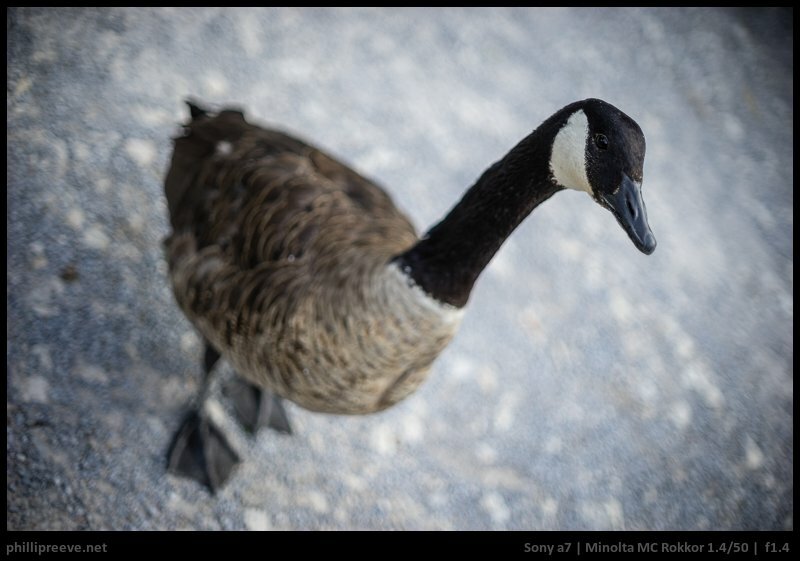 The Minolta MC 1.4/50 has a close focusing distance of 50cm which results in a reproduction ratio of about 1:8 which is a little below average for a 50mm lens. 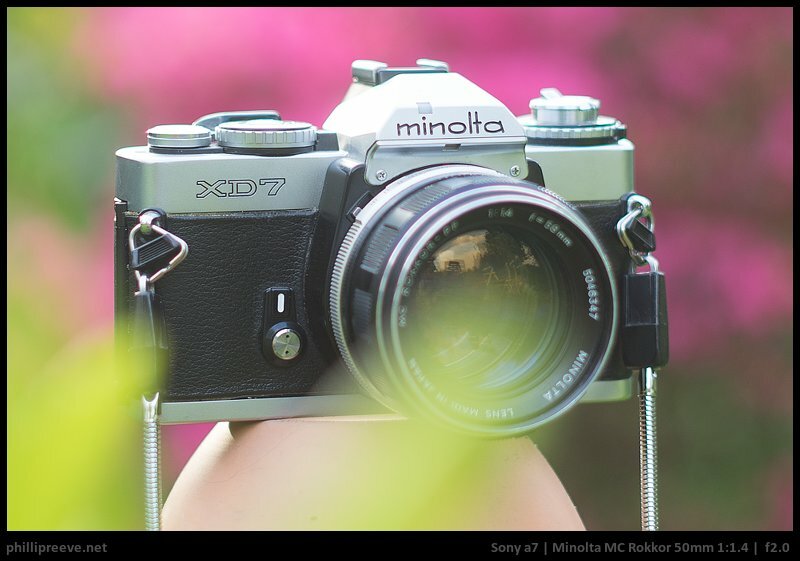 The Minolta does not feature floating elements so performance suffers quite a bit at shorter distances. 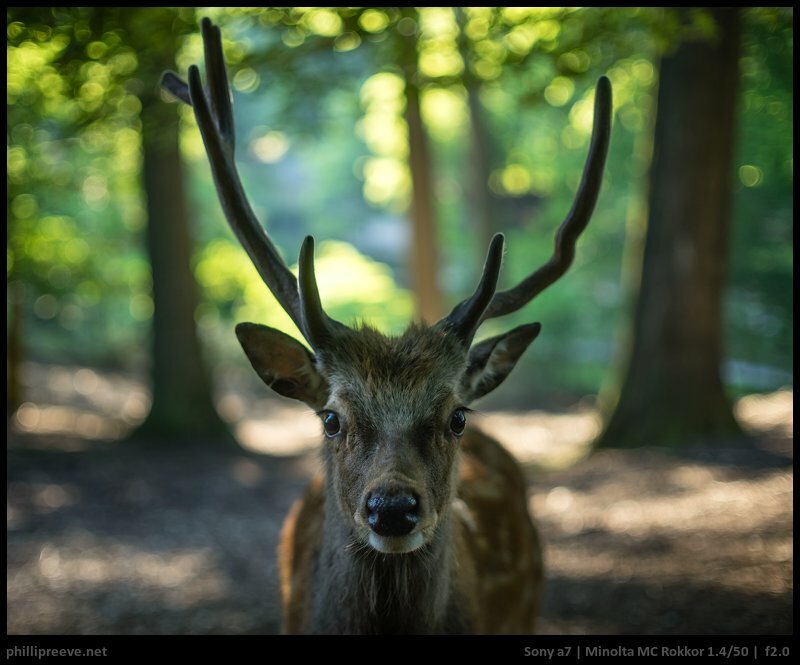 You won’t reach the same level of performance as at longer distances, no matter the aperture you are using. Results are good enough from f/2.8 but the level of CA is quite high, even in the center. My Minolta MC 3.5/50 macro performs much better here. A full aperture series can be found in my Minolta MC 1.4/50 flickr set. 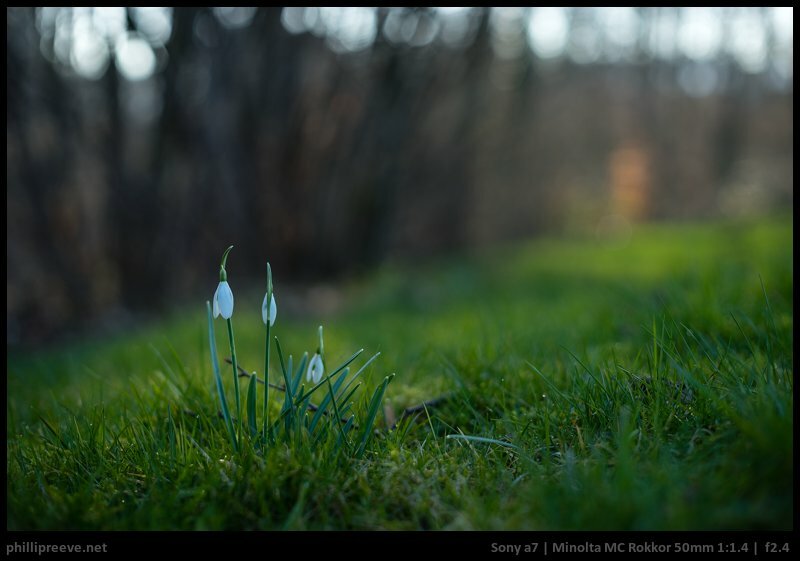 Like any classic 50mm lens the Minolta has decent resolution and low contrast at f/1.4, bokeh is quite busy und vignetting quite strong. You still can take nice pictures at this aperture but I would avoid broad daylight and look for darker scenes without busy backgrounds. There is a very significant improvement when it is stopped down to f/2 where it is quite sharp in the center of the image and the bokeh depends a lot on the situation. Sadly the MC 1.4/50 has only six aperture blades wich is detrimental to the bokeh, but since they are somewhat rounded the effect isn’t too strong at f/2 and f/2.4. Stopped down to f/2.8 sharpness is excellent across most of the frame but you need to stop down to f/5.6 for excellent across the frame performance. Flare resistance is a weakness of this lens; both veiling flare and ghosting can be bothersome. Typically for a Minolta MC lens build quality is great, and I see this as one of the stronger arguments for this lens, it is just satisfying to use such a well made lens. I think the Minolta MC 1.4/50 offers really good value, for about $80 you get a lens which is built to higher standards than today’s $1000 lenses. Optically you have to live with a number of compromises but most of the time you will be able to get really good results. All in all a versatile lens which will give you very good results for most application, at least if you stop it down a bit. Using it is a joy because it is so well made. 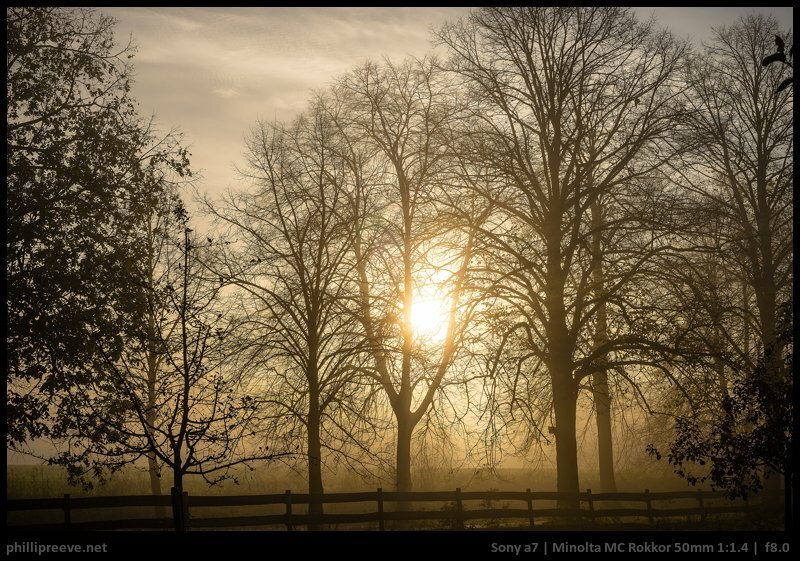 Compared to other 50mm lenses the build quality and sharpness stand out. It offers great value. 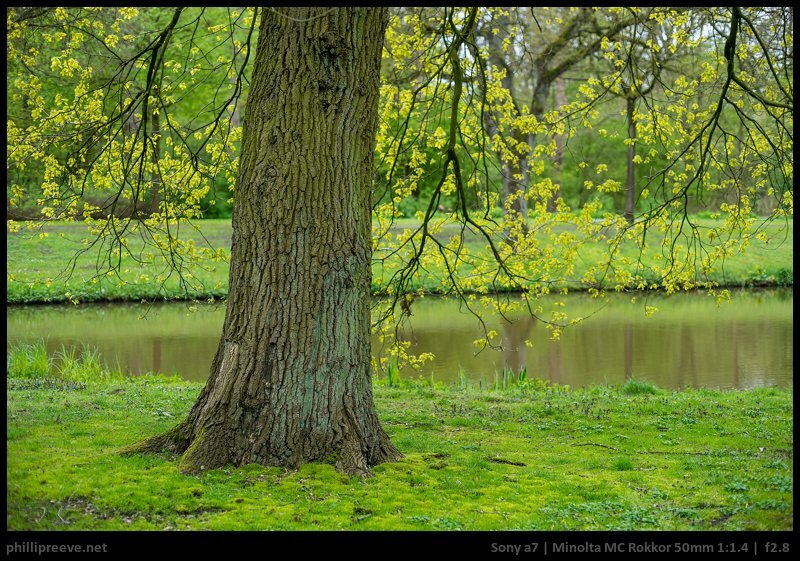 All images are processed in Lightroom from Raw. 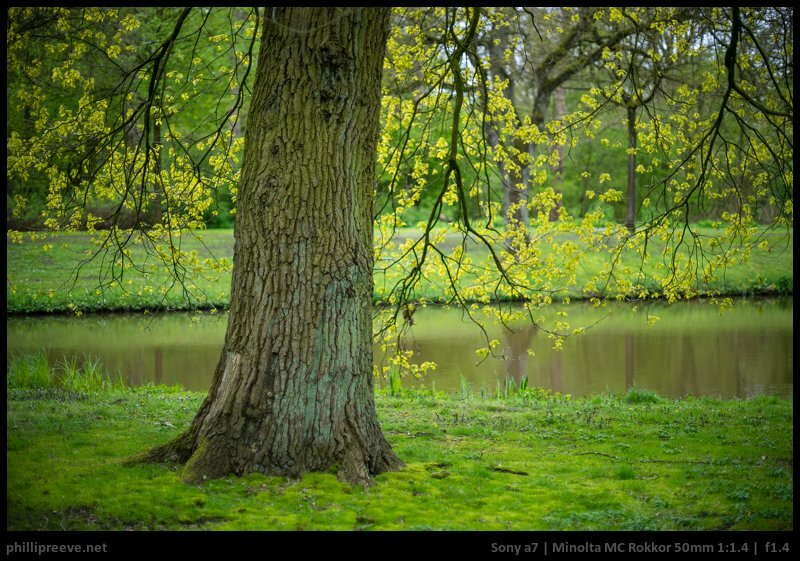 Many more full resolution samples in my Minolta MC 1.4/50 flickr album. Thanks a lot for the great review. A while ago I decided against the Minolta and for the Canon FD 50mm 1.4, mostly because of the sharpness. I love to read the article and specially the alternatives. 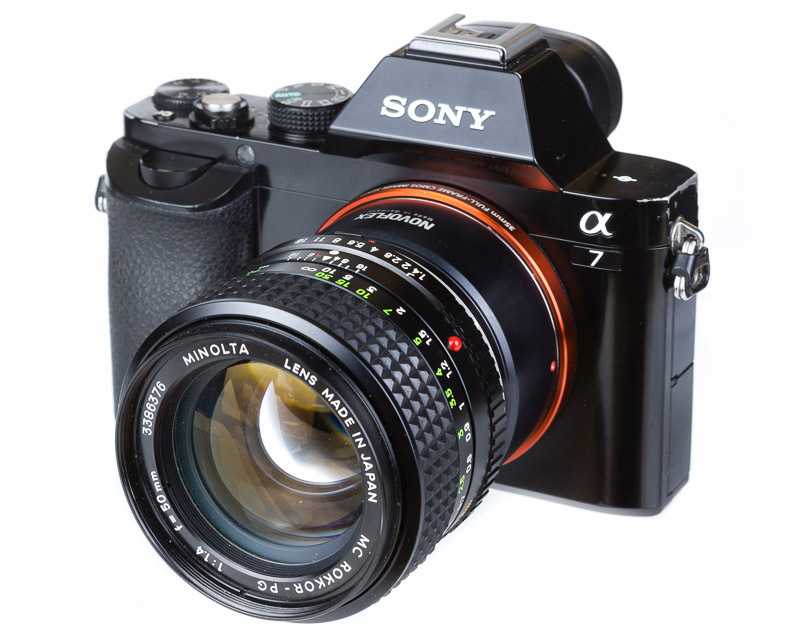 The only lens I miss at the alternatives is the Sony FE 50mm 1.8, wich is way cheaper than the FE 55mm and because of that maybe more interesting for some. Thanks again for your effort and work! This was the first lens I ever had along with my Minolta XG-1 (my first SLR). So, since I switched to Sony this year, after shoot with Nikons for long years, I decided to buy this lens again, and this is the first manual lens I have. Well, I’m so disappointed with this lens, it’s so soft, maybe because I’m use to my Sony GM lenses, it could be, but I hope I would love this thing. I want a manual lens to do some portraits, but can’t do it, not with this lens. Another problem I have is Focus Peaking, unfortunately I don’t think this thing is very accurate, the focus is always behind what I really aim when late I check on my computer. Do you have any great (cheap) manual lens for portraits to suggest? I’d like to play around with some manual lens, go back in time, it was really fun, but I want a good sharp lens with good bokeh. Does modern lens got that much better or is just this one that is not that good. 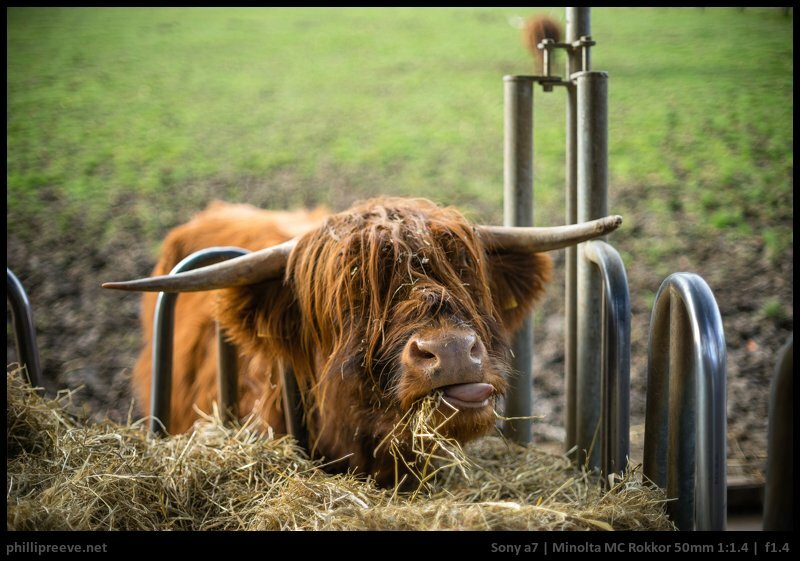 I had a Nikon 50mm 1.8 that would humiliate this one if I still had it. 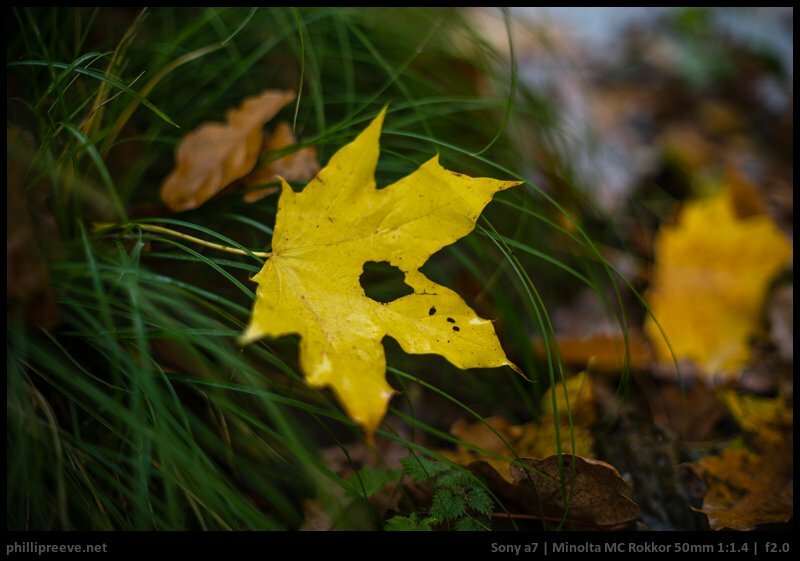 At which aperture did you use it? At f/1.4 it is certainly soft. At f/2 it is much sharper but still not great. 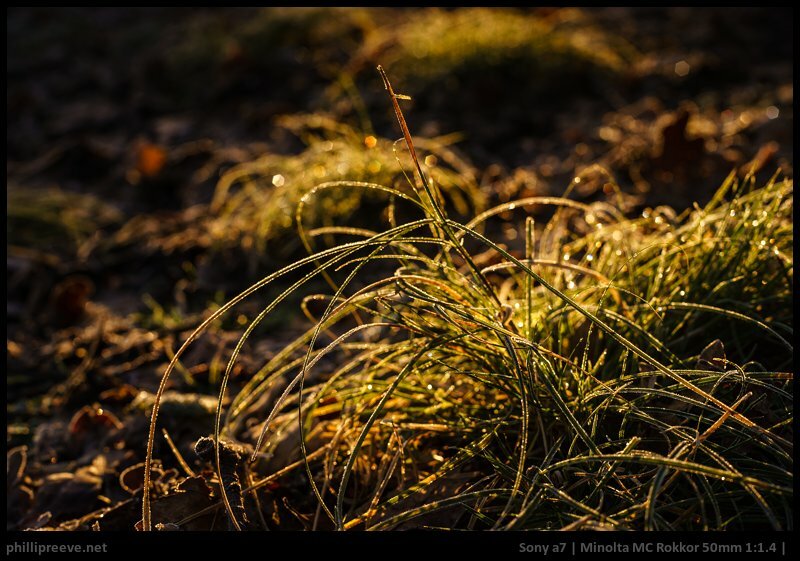 By f/2.8 though it should be competitive with your GM lenses. totally agree its the best ~50mm lens in from the list. but i totally not agree that manual focus with the FE 55mm is a pita. Its is by wire but it think its very responsive, fast, well dumped and there is auto magnification. or if you have very small sharp area at ~1.4. here you will love this lens. 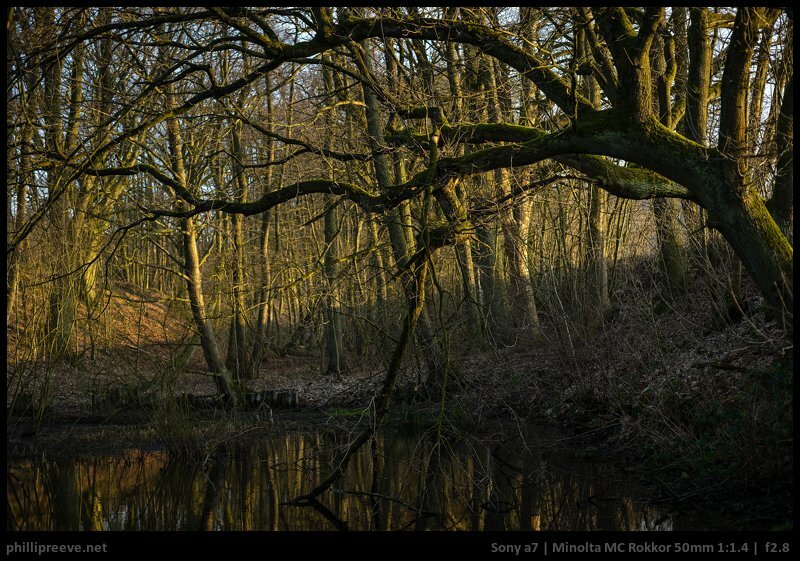 Well I used the Sonnar quite a lot for a month and the manual focus was the main reason why I sold it. Taste differs I guess. The coatings are the biggest draw back with these older MC/MD lenses I think. OK with the sun out of frame if you remember to flag the lens, but with the sun in shot, or unflagged it’s hard or impossible to control the flare. 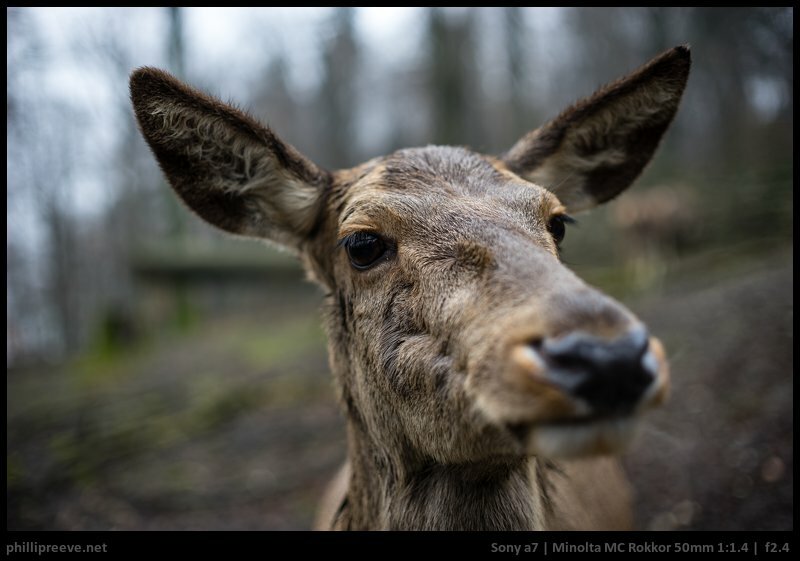 I wonder how your Pentax SMC 1.4/50 fares in that respect? My C/Y 1.4/50 is a lot better than the Miolta but not perfect. Any thoughts on how the MD version of this lens stacks up against the MC reviewed here – if I’m not mistaken the MD version is a bit younger? Or is it built exactly the same? It has been some time since I used a MD 1.4/50 so I can’t give you a really precise answer but I think they perform very similar. Build quality is a bit nicer for the MC though, especially when compare with the youngest MD. Several ppl asked me this so I took a snapshot with the better of my MDs. 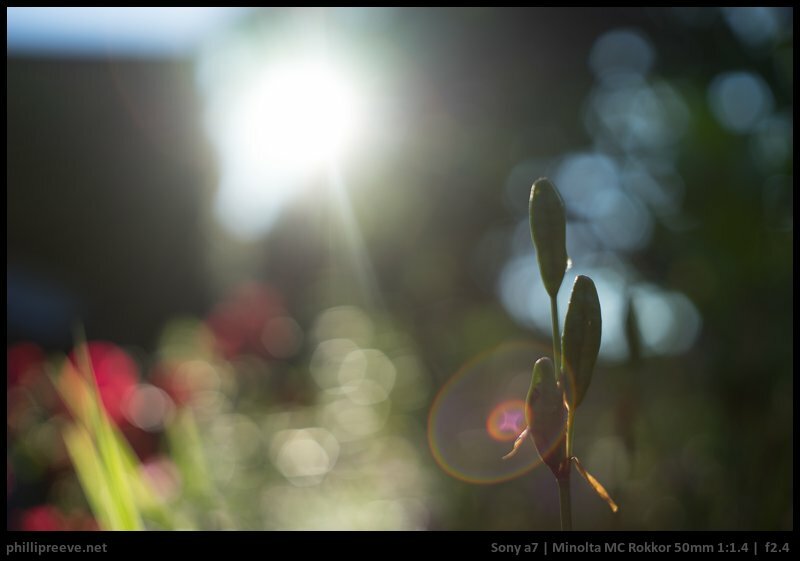 The Bokeh is a bit smoother in the later MDs–remember, with old Rokkors you have to get a decent condition lens. 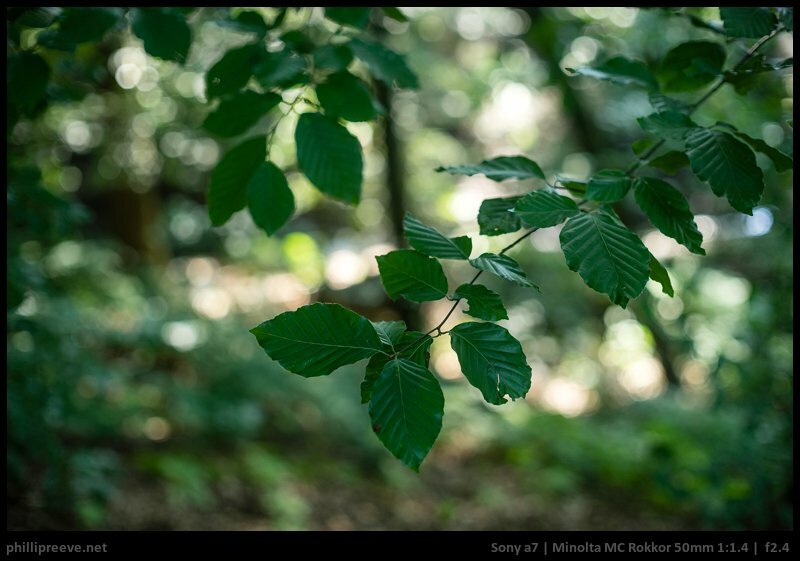 There’s a ton of great vintage 50mm lenses, the MD Rokkors’ combination of smooth Bokeh and not-insanely-sharp glass make a great portrait lens, and a decent landscape lens at f5.6-8. But there’s some serious competition from modern lenses which are just sharper and have better micro contrast. Still, the 50 has a beautiful, soft, colorful look. Smooth. 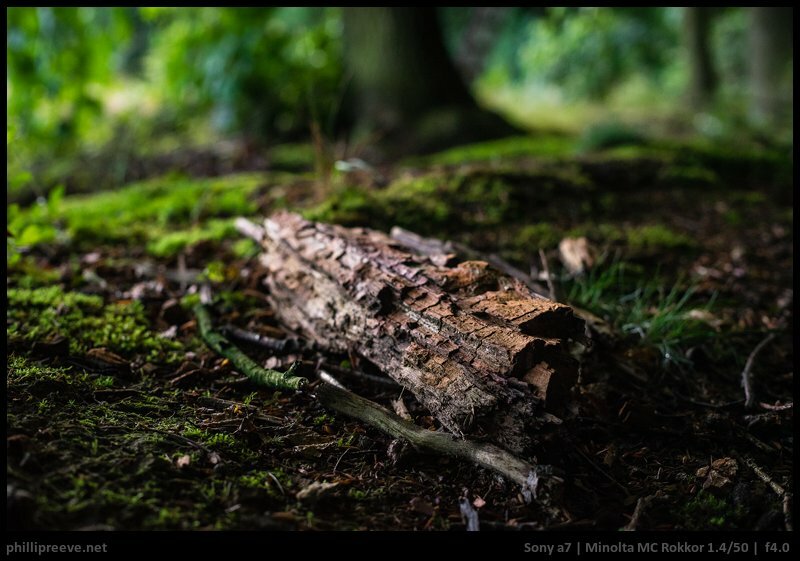 The 58 is a bit less sharp and contrasty, but has beautiful bokeh and is a great video portrait lens as the lack of contrast acts like a log curve. Well, to be completely truthful, I actually hate having to manual focus. I’m lazy that way. But I do like the super low prices, allows me to shoot with a class of lenses that I otherwise NEVER would have considered buying. Super sharp + oodles of character. I actually _like_ the contrast loss at low f numbers and the low contrast haziness with the sun in the frame that you have with these old lenses. Nice sixties / seventies look. Makes the images come alive! Pop Photo did a test of 32 “normal” lenses in 1976, the Minolta MC 50/1.4 was one of the best for center sharpness. I modified one to rangefinder couple for the Leica. Well worth it. 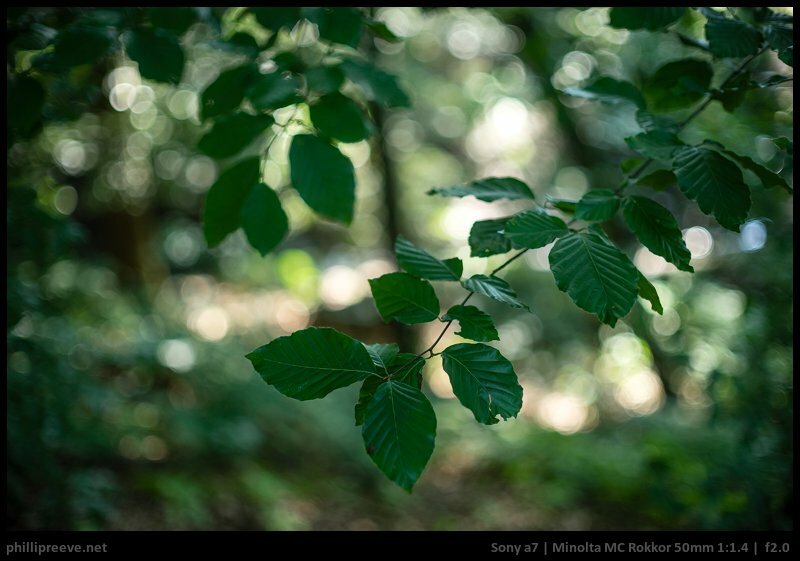 Another “forgotten, inexpensive” lens- the Konica 50/1.7. Also converted one for the Leica. Close to a Summicron for performance, about 1/20th the price. Sharper than the Konica 50/1.4, only 1/2 stop difference. Phillip, how similar are all of these 50mm lenses for landscape? I know the standard wisdom is “all 50mm lenses are good at f/8”. I suppose my major concerns are corner sharpness and CA for landscape (maybe lens flaring?). Is there an image quality difference to be had, going with the expensive FE 55mm lens? 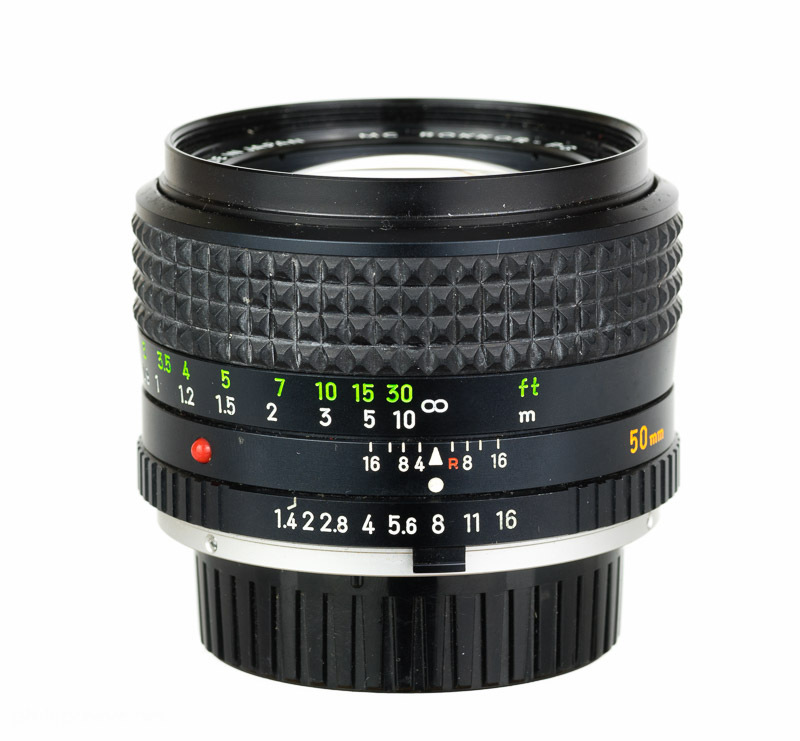 Ignoring build quality for a second, which of the old MF lenses would be best? I remember your review. I’ll take a look at it again. Thanks! Also, my grandfather gave me his old Chinon 55mm 1.7. I don’t know how good it is optically, but I bet you would love the build quality. It’s a solid chunk of metal, and heavier than any other prime lens I’ve ever held. It is a pleasure to use the MD version of this lens. Wonder how it compares to the FE 50mm f1.8, though. The FE 1.8/50 has a little smoother bokeh and very high contrast from f/1.8 but it isn’t one of the sharper 50mm lenses out there. Thanks for the review! 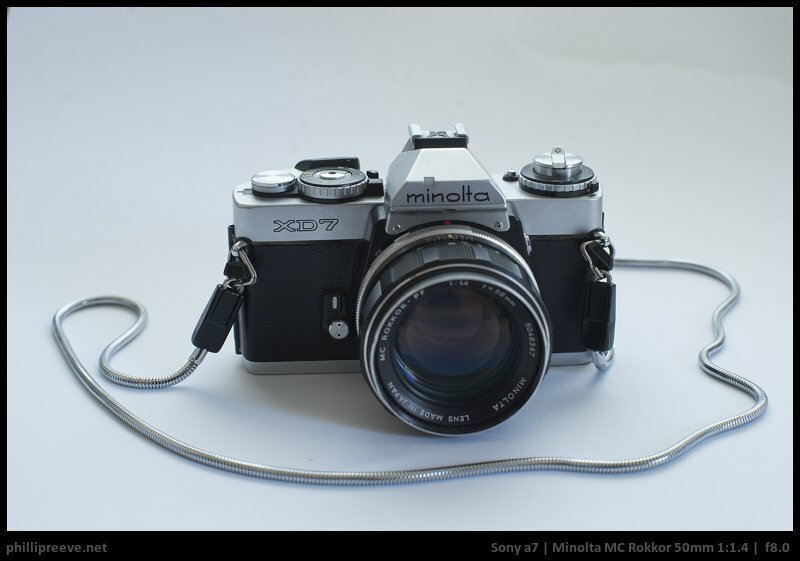 Do you know what adapter you would need to use this with a Canon 5D classic? 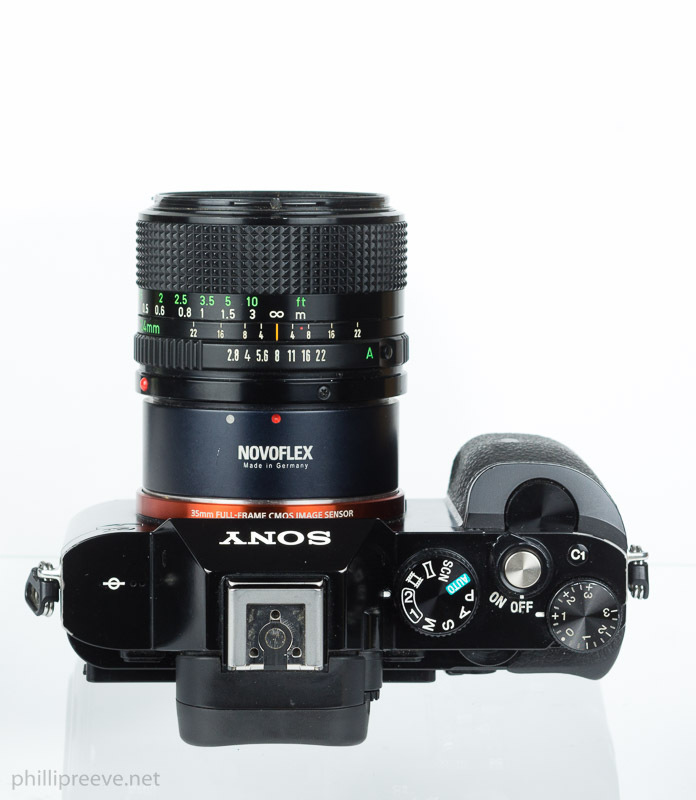 There is no such adapter because of the flange focal distance. I have one but unfortunately, the rear lens is broken. I patiently look for another one in a poor condition but with a good rear lens to repair mine. In the mean time, I was wondering if I could pick a rear lens from another model. Does anybody knows if this rear lens is the same on some other objective ?